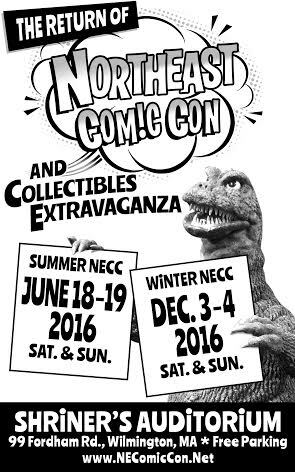 Northeast Comic Con & Collectibles Extravaganza has announced our scheduled dates for 2016 including June 18-19 and Dec. 3-4 at the Shriners Auditorium in Wilmington, MA. Our December show is the Holiday Shopping Show for Nerds and the People Who Love Them. Comic, fantasy, science fiction and cartoon artists, authors, creators, publishers and other from the Creative arts community showing their work and mentoring young people. Celebrity Guests will be signing autographs all weekend, along with offering Photo Ops, and the guests will be announced continuously for the next 6 months on our website, facebook page and twitter feed. Celebrity and Cosplay Photo Ops along with Hollywood vehicles. Gaming from Game Underground with free play on vintage and modern video game systems, Starship Horizons Bridge Simulators, Trivia contests with Morgan White Jr along with Table Top Gaming. Live Entertainment including Music, Puppetry, Mask Making, Special FX Makeup, and other aspects of the Creative Arts. VIP Opportunities will be available with many different celebrities.